days (first period) where upon the mussels were exposed to the reversed salinities for another 15 days (second period). experiment (3.2% to 4.0% d–1) where the salinity varied between 24 and 13 psu during the growth period. 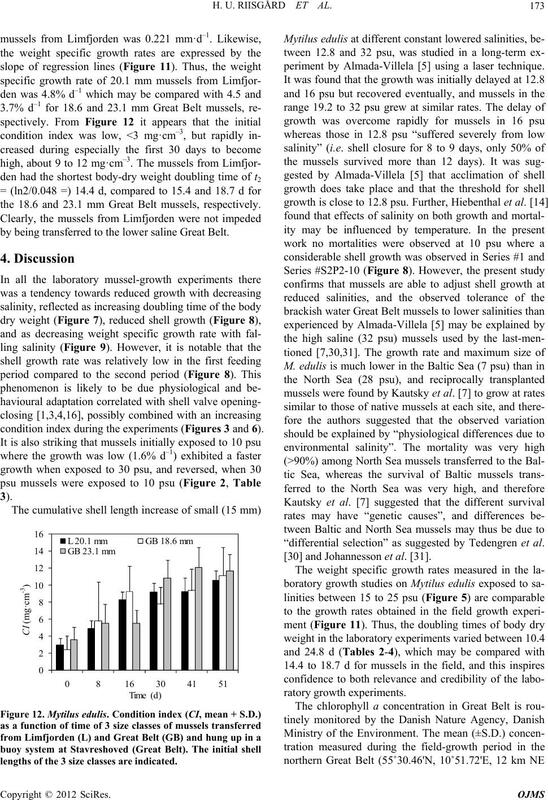 lopment and survival of mussels [1-9]. H. U. RIISGÅRD ET AL. 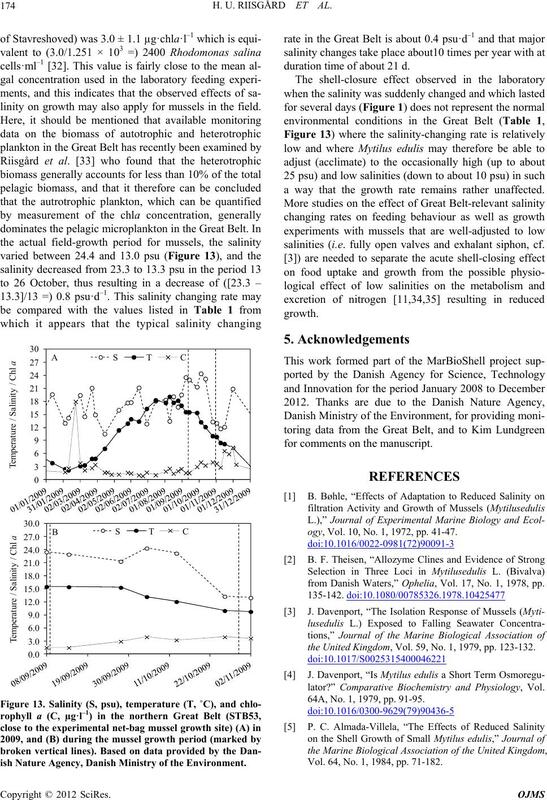 which shows data for the 10 year period 2000 to 2010.
growth of mussels suspended in net-bags in Great Belt. stock solution flask could be adjusted to be near constant. 15, 22, 30, and 32 for determination of body dry weight. mortalities of experimental mussels were observed. 90˚C; shell lengths were measured with a vernier gauge. analysis of variance (ANOVA)” in Sigma Plot. 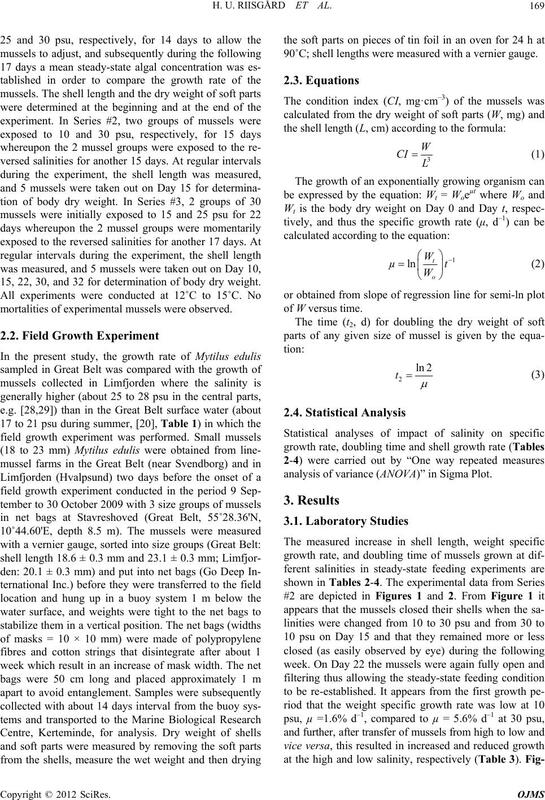 × 100] = weight specific growth rate; t2 (=ln2/µ) = doubling time. 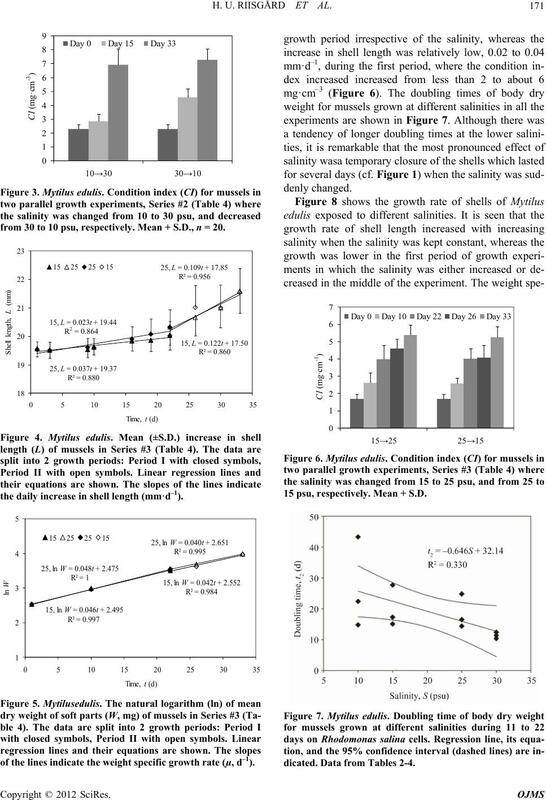 Mean ± S.D., n = 20.
respectively; ΔL/t = daily increase in shell length; µ = weight specific growth rate (from slopes in Figure 5); t2 = doubling time. Mean ± S.D., n = 20.
closed or not fully open. 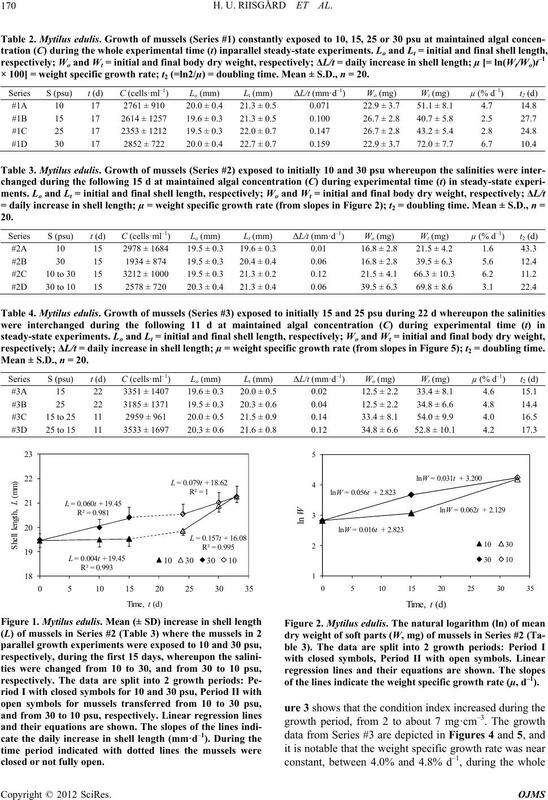 of the lines indicate the weight specific growth rate (µ, d–1). from 30 to 10 psu, respectively. Mean + S.D., n = 20.
the daily increase in shell length (mm·d–1). 15 psu, respectively. Mean + S.D. dicated. Data from Tables 2-4.
changed from 25 to 15 psu and reverse. initial shell length of the 3 size classes are indicated. the 18.6 and 23.1 mm Great Belt mussels, respectively. by being transferred to the lower saline Great Belt. condition index during the experiments (Figures 3 and 6). lengths of the 3 size classes are indicated. periment by Almada-Villela  using a laser technique. “differential selection” as suggested by Tedengren et al. 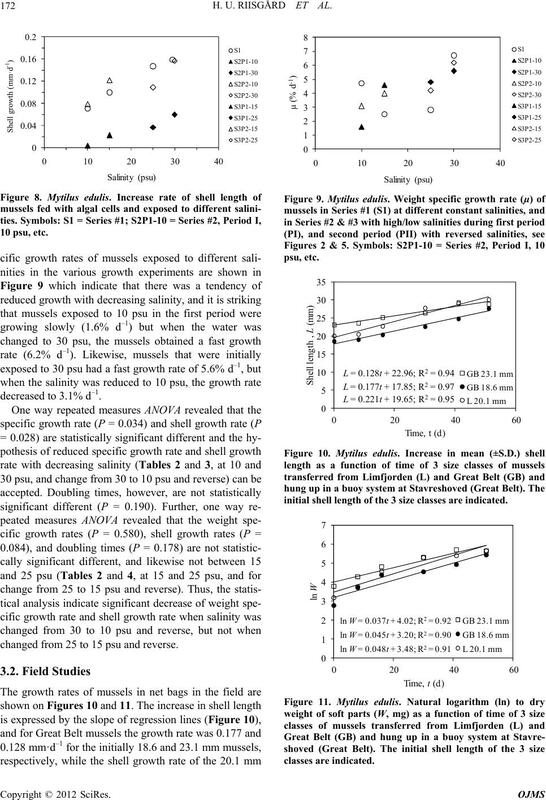 and Johannesson et al. .
linity on growth may also apply for mussels in the field. ish Nature Agency, Danish Ministry of the Environment. duration time of about 21 d.
a way that the growth rate remains rather unaffected. salinities (i.e. fully open valves and exhalant siphon, cf. for comments on the manuscript. ogy, Vol. 10, No. 1, 1972, pp. 41-47.
from Danish Waters,” Ophelia, Vol. 17, No. 1, 1978, pp. the United Kingdom, Vol. 59, No. 1, 1979, pp. 123-132.
lator?” Comparative Biochemistry and Physiology, Vol. 64A, No. 1, 1979, pp. 91-95. Vol. 64, No. 1, 1984, pp. 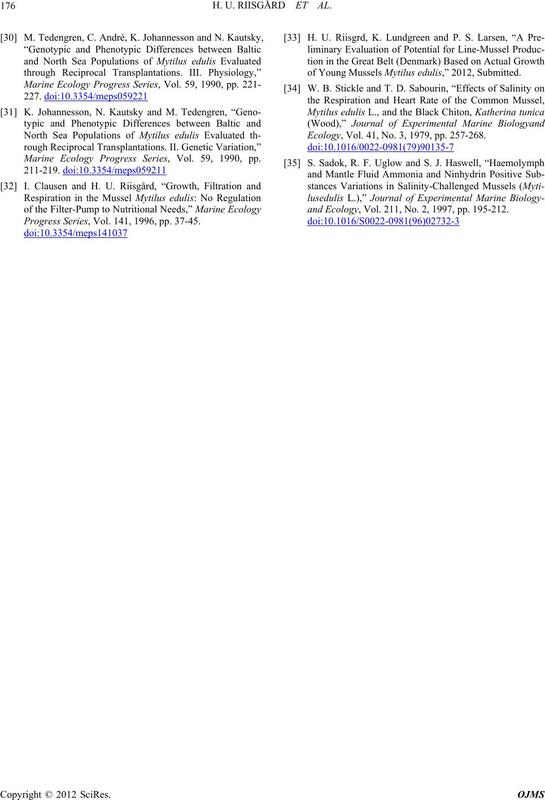 71-182.
in the North-Eastern Baltic Sea,” Marine Biology, Vol. 140, No. 5, 2002, pp. 991-999. Marine Ecology Progress Series, Vol. 228, 2002, pp. 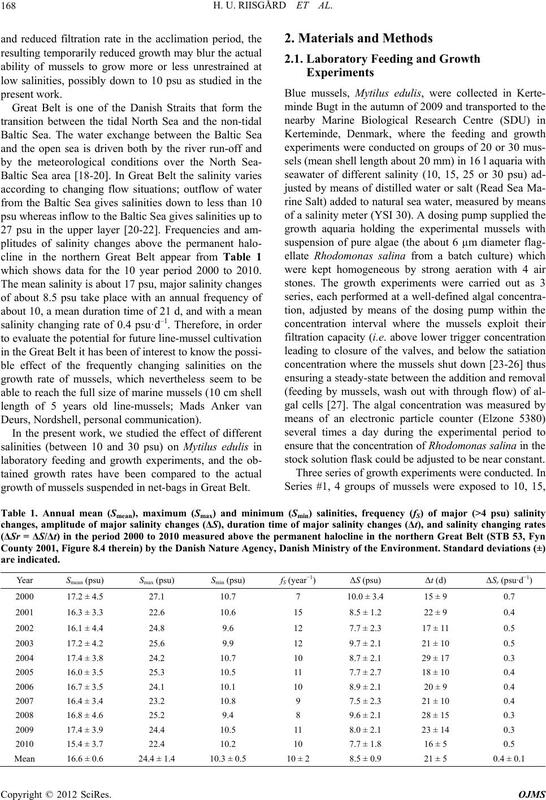 Northern Baltic Sea,” Boreal Environment Research, Vol. Vol. 18, No. 2, 1975, pp. 89-97. Series, Vol. 266, 2004, pp. 157-171. Bulletin, Vol. 12, No. 6, 1981, pp. 183-186. Geophysical Union, Coastal and Estuarine Studies, Vol. culture,” Fyn County, Odense, 2001. Ophelia, Vol. 42, No. 1, 1995, pp. 163-178. J. Bendtsen, K. E. Gustafsson, J. Söderkvist and J. L. S.
Vol. 75, No. 1-2, 2009, pp. 138-149. Interpretation,” Marine Ecology Progress Series, Vol. 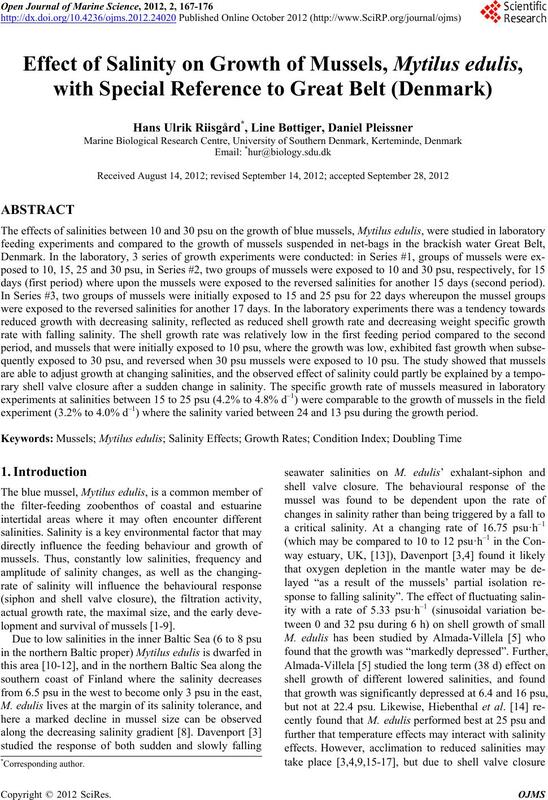 Journal of Shellfish Research, Vol. 25, No. 3, 2006, pp. 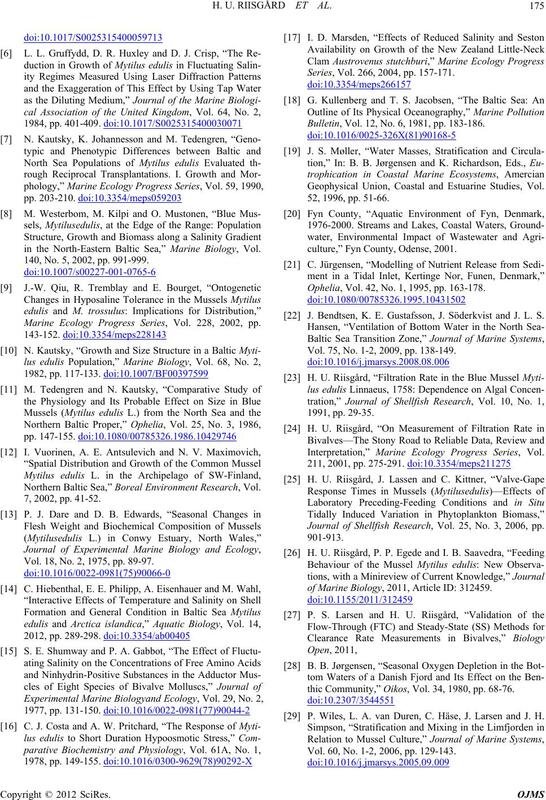 of Marine Biology, 2011, Article ID: 312459.
thic Community,” Oikos, Vol. 34, 1980, pp. 68-76. P. Wiles, L. A. van Duren, C. Häse, J. Larsen and J. H.
Vol. 60, No. 1-2, 2006, pp. 129-143. Marine Ecology Progress Series, Vol. 59, 1990, pp. Progress Series, Vol. 141, 1996, pp. 37-45.
of Young Mussels Mytilus edulis,” 2012, Submitted. Ecology, Vol. 41, No. 3, 1979, pp. 257-268.
and Ecology, Vol. 211, No. 2, 1997, pp. 195-212.